Details of the small Montana firm’s $300 million deal spark calls for investigation as Puerto Rico’s energy crisis persists. Whitefish Energy workers repair lines and towers in Puerto Rico as the company's contract comes under scrutiny. Puerto Rico’s grid rebuilding efforts are mired in controversy, as three-quarters of Puerto Rico -- and the 3.4 million American citizens who call it home -- are still without power more than a month after Hurricane Maria made landfall. The biggest controversy surrounds a tiny two-year-old Montana company called Whitefish Energy, which happens to be based in the hometown of Interior Secretary Ryan Zinke. 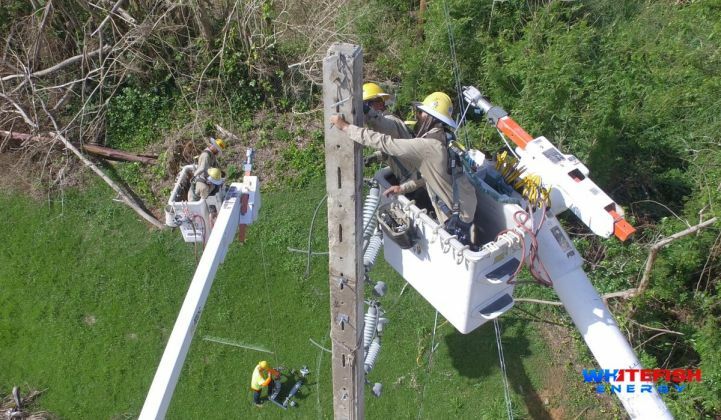 The company secured a $300 million contract to build out transmission lines -- the largest doled out by the Puerto Rico Electric Power Authority (PREPA) so far -- despite having only two full-time employees as of the day the storm hit. Key details of the Whitefish deal have now been made public. A copy of the contract was obtained by Yanira Hernández Cabiya at Caribbean Business and publicized on Twitter by reporter Ken Klippenstein. Most notably, the document includes a clause that the government is prohibited from reviewing the company’s profits related to its relief efforts. 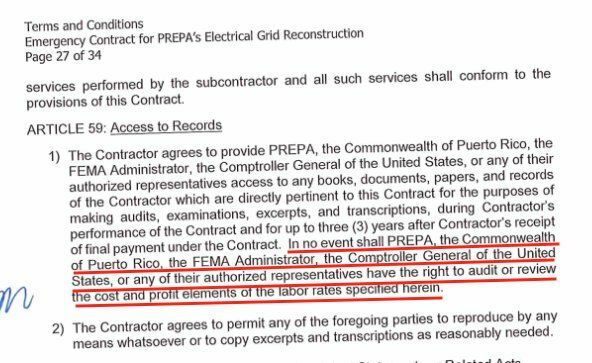 "In no event shall PREPA, the Commonwealth of Puerto Rico, the FEMA Administrator, the Comptroller General of the United States, or any of their authorized representatives have the right to audit or review the cost and profit elements,” the contract states. The contract also states that the Puerto Rican government "waives any claim against Contractor related to delayed completion of work." The document confirms earlier reports of wages for subcontractors, who make up the majority of Whitefish’s workforce, at $462 per hour for a supervisor and $319 per hour for a line worker. In addition, Whitefish subcontractors deployed to Puerto Rico are permitted to spend $332 per day on accommodations and nearly $80 per day on food. UTIER, the electrical workers' union of Puerto Rico, expressed alarm at those rates, tweeting: "We need support and help, but under these conditions it is impossible and questionable. Who allowed this?" Whitefish says it now has close to 300 mostly subcontracted workers in the region working on the rebuilding effort for the island’s 2,400 miles of transmission lines, 30,000 miles of distribution lines and 300 substations. Amid the contract controversy, the company has been actively tweeting videos and other updates on its progress. But as the rebuilding process continues, scrutiny of the plum contract scored by such a small company is intensifying. The Federal Emergency Management Agency (FEMA) issued a statement Friday that it "has significant concerns with how PREPA procured this contract and has not confirmed whether the contract prices are reasonable." The agency said it was not responsible for awarding the Whitefish contract and is engaged with PREPA's legal counsel to learn "how the contract was procured and how PREPA determined the contract prices were reasonable," according to the statement. In response to new reports on the contract, Congressman Raja Krishnamoorthi‏ of Illinois called on the House Oversight Committee to launch an investigation into Whitefish, warning of "sweetheart contracts and backroom deals” eroding budgets and constituents' confidence in government. House Democratic leader Nancy Pelosi had previously called for a probe into the contract. Puerto Rico Governor Ricardo Rossello also requested an audit of Whitefish in a letter to the Homeland Security inspector general’s office this week. In addition, eight congressional Democrats have asked the Interior Department inspector general for a separate investigation, citing concerns over possible ties to the Trump administration. "Whitefish is primarily financed by a private equity firm that is run by a contributor to the presidential campaign of Donald Trump. We're concerned that Whitefish might have overstated its connections with the Trump administration to obtain the contract," they wrote in a letter sent Wednesday. The contributor referenced in the letter is Joe Colonnetta, a partner at HBC Investments and an investor in Whitefish Energy. A spokesperson for Whitefish and Colonnetta told ABC News that his donations had "no influence whatsoever to impact the contract." Secretary Zinke, meanwhile, is under scrutiny for potential ties to Whitefish founder Andy Techmanski, as both hail from the same small town. However, both parties have denied any wrongdoing. While the scrutiny mounts around Whitefish, many others in the private sector see opportunity and dollar signs as they look for contracts to both rebuild and reinvent Puerto Rico’s demolished power grid. Before the storm, PREPA’s grid was already crumbling, with much of it run on dirty, expensive oil. The utility declared bankruptcy in July with $9 billion in debt. The storm wiped out much of the transmission and distribution grid connecting the power generation to the cities. Meanwhile, government agencies are sparring over who’s at fault for the slow rebuilding effort, which has led to dire situations like surgeons using cellphones as flashlights in surgery. At the same time, some stakeholders and observers are using the disaster to argue that privatizing the government-owned utility is the answer. The federal board that oversees PREPA said this week that it plans to appoint an outside manager, Noel Zamot, as chief transformation officer to lead the rebuilding efforts. Zamot, a retired Air Force colonel, worked with the board over the summer on attracting private companies to Puerto Rican infrastructure projects and has reportedly been supportive of the idea of privatizing the power company. While Zamot appears eager to bring in the private sector, not everyone is eager to have him in charge. Governor Rossello reportedly plans to appeal the board’s decision to appoint Zamot and will seek to retain authority over PREPA. Puerto Rico’s Department of Economic Development and Commerce Secretary, Manuel Laboy, told Bloomberg that the government is considering a series of microgrids that could use solar and batteries along with other renewables. Battery-connected microgrids are emerging as an important technology in a world with increasingly extreme storms. Laboy said he’s talked with Tesla and other companies, adding that there could be a competitive bidding process for a clean energy rebuilding effort. Correction: A previous version of this story failed to note that Yanira Hernández Cabiya at Caribbean Business originally obtained the contract. The story has been updated.